My sister’s godfather, Stan, was a music dealer. He mostly dealt in pianos, but in the 70s during the folk-rock/singer-songwriter boom, if you weren’t stocking acoustic guitars, you were missing out on a big part of the business. When my sister was confirmed, this was her gift. I was forbidden from touching the guitar, let alone playing it — it was hers, it was a sacred, and the implication was that there was no way I would know what to do with it anyway. Trouble was, she didn’t play it much either. So there it stayed, in its case, in the attic. In New Jersey. Acoustic guitars are delicate instruments. They need regulated temperature and humidity or the wood will suffer over the long term. The attic during a hot, humid New Jersey summer is one of the worst places to keep something like this, but nobody in our family knew that, so that’s where it lived. At least it was in a hardshell case. As I learned to play guitar, my sister moved out, took the guitar with her, shared it with boyfriends (one of whom thought it sounded “cool” as a six-string), and generally gave it use. Some hard use, as I found out later. 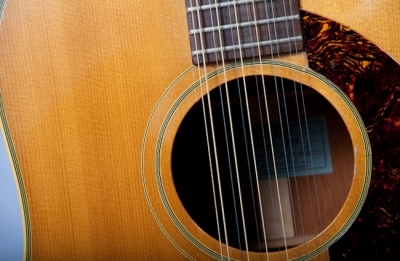 When I graduated college, I had started to write about music and had played in a backyard band, so my sister gave me the 12-string as a graduation present. I was super thrilled, even if it had some wear — sloppy stuff like the side of the neck having nicks in the finish from leaning it up against tables and desks and stuff. It was still in fairly good shape but its age was starting to show. 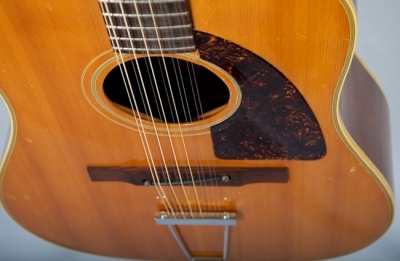 The spruce top was a little buckled too; again, keeping it at concert pitch and storing it in a hot attic is not good. Then again, over the years, I put my own marks of damage on it, too. 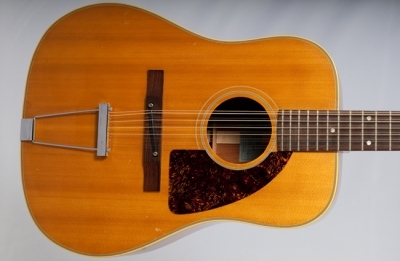 I still have not forgiven myself for dropping the case lid on the spruce top, removing a chunk. Despite my emotional attachment, I just didn’t play it much. It was not comfortable, and to be honest, it was not getting any better in my care. This was a 30-year-old guitar, with a finish that was checking, a missing Epiphone pickguard logo, chips and small chunks missing, no humidity control…I didn’t want it to die on my watch. I brought it to Gryphon to trade it in for something that was more my style. The neck was huge when I was a kid…and still huge as an adult. I have smallish hands so I assumed it was just me. When the guys from Gryphon said “That neck was huge!” I felt a lot better. I did not get much for my trade-in, but I had to be realistic. 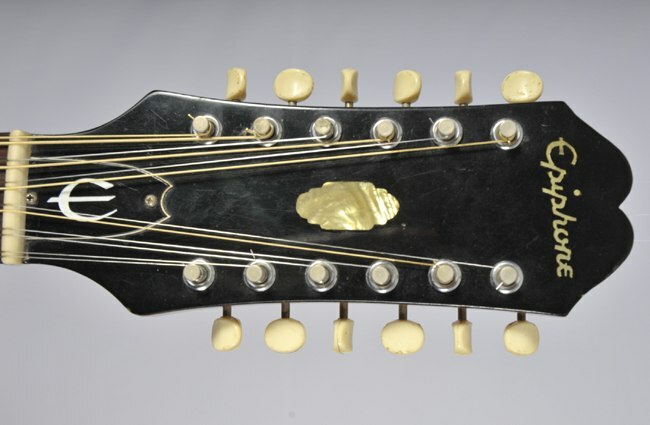 Had it been in better shape, I would have been able to command a high price — this was the 12-string that Roy Orbison favored, and the 1974 model had a set neck rather than a bolt, as the later models did. Ultimately, I was happy that it was going to a place that really knew what they were doing. They restored it and sold it for five times what I sold it for. I have no regrets. 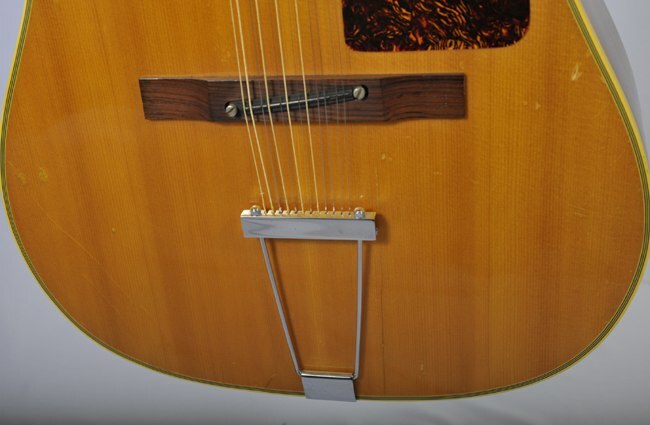 I found a more compatible 12-string a few years later.